Filed to: Oopsie!Filed to: Oopsie! I like to think I’m a friendly guy. I frequently wave at people and tend to like a lot of tweets on Twitter. Today, that friendliness was transformed into something dark and unfamiliar. Today, I accidentally re-liked hundreds of years-old tweets, alarming some, delighting others, and leaving me very, very sorry. Please, let me explain. This morning, I decided to Marie Kondo my Twitter account and did a quick search for a way to reset my list of Liked Tweets without paying for a service or authorizing a questionable third-party app that might embarrass me in some way. If I was already going to nuke some old tweets and give my following list a spring cleaning, I figured, I might as well do something about the more than 17,000 (yeah, 17,000!) tweets I’ve faved over the years. So I found a simple script on Quora and gleefully shared it with my coworkers. “Oh nice,” they said, “wow.” But do not use this script—not without great caution. For I now know that it’s easy to automatically re-like hundreds upon hundreds of tweets with such a script, which is exactly what I did. Jesus Christ. All I had to do was open Opera’s developer tools, paste in the code, and tap the enter key. The script seemed to work like a charm for a bit, but after 15 minutes or so I noticed some errors in the console. The tab had gone blank. Undeterred, I refreshed the window, re-ran the script, and got ready to head into work. After taking a nice, hot shower and putting on a fancy sweater, I strolled in the direction of the subway, enjoying the unseasonably nice weather this fine February afternoon. Picture me, truly at peace in this moment. Coatless, preparing to uproot my life in mere days and explore the world beyond the net. Entirely unaware what I had done until I got a message from my former coworker and friend, Jordan Novet. I popped open Twitter on my phone, and it quickly became clear that my personal Relikeocalypse had begun. I called my partner, Amanda, to ask her to shut my laptop at home as fast as she could as I caught the train. No answer. You may be wondering why I boarded that train at all, dear reader. The truth is, I found this all hilarious for a few seconds before panic set in. I strained to respond to the tweets from dozens of different colleagues, friends, and acquaintances who wanted know what was up, and the many more strangers who reached out to me, quote-tweeted me, and so on. Great. SO GREAT. Soon, Amanda answered and quit the open browser window. It was too late, of course. The script may have stopped, but the notifications were already sent. I may never truly know how many tweets I re-liked, but a conservative estimate puts it at more than 400. So to everyone I accidentally like-spammed today, all I can say is: Whoops!!!! Sorry! On my way to the office, the L wasn’t running due to what MTA workers called a “gas leak.” Friends, I wish the leak was to blame for my folly. It was not, but I think I know what happened. I believe my mistake involved re-running the script before Twitter had updated my list of likes, leading it to re-like a certain subset of the tweets I’d just recently unliked, thus firing off many, many unintended notifications, and again, sorry! It was an accident! Imagine how I felt walking into work, as my coworkers swarmed Slack gleefully celebrating my very big goof. My impulse, at this stage of the blog, is to talk about the embarrassment I felt. Instead, I will be honest. I’ve quickly cooled off and now this is funny again. I’ve spent the majority of my time in New York (around eight years) somewhere else. I’ve spent it online, with you, working, streaming, tweeting, blogging, and yes, liking lots and lots of tweets. 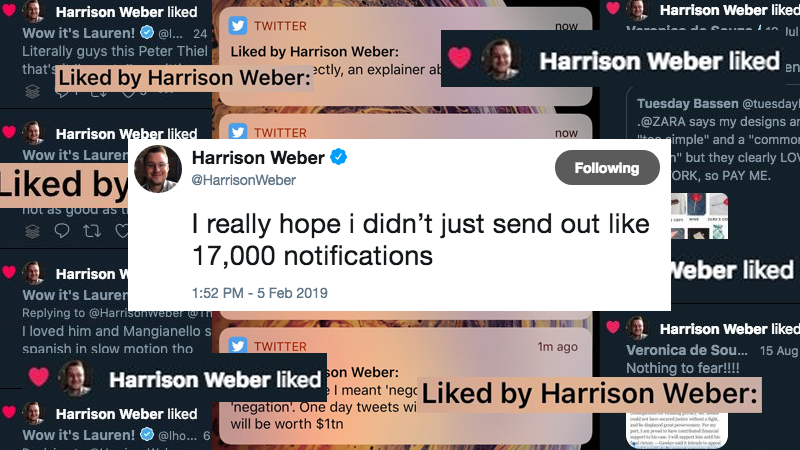 And now that I’m moving away, at least for a little while, I’m energized by the idea of putting some distance between me and the news, even more between myself and social media, and as much as possible between Harrison Weber and all the joy and utter exhaustion the internet brings him. That’s something I’ll happily like a thousand times.